Alberta’s Energy Policy Simulator (EPS) is the first free and open-source tool of its kind, allowing you to visualize the interactive and cumulative effect of current, proposed, or potential policies on the province’s carbon pollution and energy trajectory. From renewable energy to pollution pricing and mass transit to efficient buildings, you can use the tool to gain a deeper understanding of the specific policy actions that Alberta can take to decrease its climate-destabilizing carbon emissions. Explore Alberta’s Energy Policy Simulator. Developed by the Pembina Institute in collaboration with Energy Innovation, Alberta’s EPS can be run in a web browser or downloaded onto your desktop. The tool is based on non-partisan, published data from government entities and other credible sources, and was reviewed by a broad group of policy experts from industry, government, and academia. 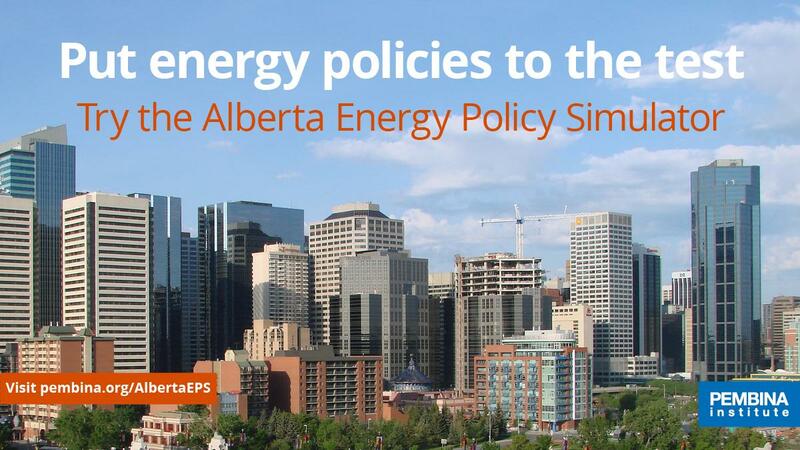 Alberta’s EPS builds on the success of Canada’s Energy Policy Simulator, launched in 2018. Its release is part of the Pembina Institute’s ongoing efforts to improve the public’s awareness of how energy policies can be designed to achieve Canada’s targets for reducing carbon pollution. Our FAQ answers commonly asked questions about the Alberta Energy Policy Simulator. We are happy to take further questions at policysolutions@pembina.org. The Energy Policy Simulator is the first free, open-source model allowing users to explore the effects of different policies for one jurisdiction’s energy system across economic sectors. The model can be used in two ways: through the web interface, or locally on a personal computer by downloading the model. Downloading the tool allows one to explore the sources used in establishing the business-as-usual scenario, change underlying assumptions, and even create custom versions of the simulator, subject to its open source license. The core EPS model structure was developed by Energy Innovation, which has also produced policy simulators for the U.S., China, Mexico, India, Indonesia, and Poland; the Canada and Alberta versions were developed in partnership with the Pembina Institute. The EPS allows users to test the cumulative and interactive impacts of many different policy levers for reducing our carbon emissions. Alberta’s EPS was developed using data made publicly available by the Governments of Alberta and Canada. A user-friendly interface allows you to visualize results graphically and to save, alter, and share different policy packages. There is extensive online documentation detailing how the model works. Tags: Alberta, Provincial Policy, Climate Policy. The Government of Alberta expects to achieve significant reductions in methane emissions through carbon pricing policies, but there are significant uncertainties and gaps in the regulations. This policy brief explains the problems and provides suggestions to ensure there is a meaningful price on methane emissions in Alberta's carbon pricing system. This report summarizes the presentations of the 2018 Alberta Climate Summit.